Beer culture in Utah is surging. Several commercial brewers in the Salt Lake City region alone make complex beer, and the homebrew society there is equally as enthusiastic. Imagine living in a candy store staffed by world class chocolateers and pepperminters. In this store there is one rule: you can only eat Tic-Tacs. That’s a bit like what beer lovers experienced in Utah for generations. Until only recently, the only beer in Utah you could buy or drink in bars were, essentially, light beers. The law of the land reflected the Mormon belief that one should abstain from alcohol. In a compromise, lawmakers allowed that the beer had to be no more than 4 percent alcohol by volume, which is less than a Bud Lite. Some of them (known as “3.2” beers because that’s the alcohol by weight) are tasty, but as craft beer lovers know, bold flavor usually results in higher alcohol. In the past few years, local brewers have been allowed to create higher alcohol bottled beers that Utahns can enjoy locally. I’ll focus on two Utah breweries – Epic Brewing and Wasatch Brewing – who have seized the opportunity to brew amazing beers like kids let out for recess after years of detention. Utah has a beer culture that stretches to its founding. In “The Beer in the Beehive: A History of Brewing in Utah” (Dream Garden Press, 2008), author Del Vance chronicles the way that Utah (nicknamed the Beehive State for its founders’ tight-knit community and hard work) has taken a particularly strong stance against the beer industry relative to other states. Settled in 1847 by Mormons (members of the Church of Jesus Christ of Latter-day Saints, or LDS Church) who arrived in the Salt Lake Valley, Utah joined the U.S. as a state in 1896. 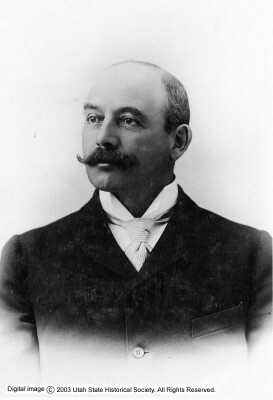 According to Vance, brewery history in the state started soon after the settling. By its end, Prohibition was clearly unpopular, even in Utah. At 3:31 p.m. on Dec. 5, 1933, the state cast the deciding vote to repeal the Eighteenth Amendment. It wasn’t until Jan. 1, 1934, that Utahns could legally drink beer again, although only at the “3.2” level. Even today, “3.2” beer is the only kind allowed on tap in Utah, and the only kind allowed to be sold at convenience and package stores. By the time Epic Brewery was established in 2010, laws allowed breweries to sell higher alcohol beers to the public from the premises. This opened up a giant opportunity for the new brewery, and it’s taken advantage of it. It has competition, to be sure. Uinta Brewing is the biggest brewery in the state, and it’s joined by Moab Brewery, Desert Edge Brewery, Mount Olympus Brewery, Red Rock Brewing and others. I had a chance to visit Epic with Steve Koonce. Steve is a sales representative for Epic who knows more about beer than most. As a homebrewer and craft beer enthusiast, he was the perfect tour guide. We started at the brewery, housed in a renovated fast food restaurant, which is about 10 long blocks south of the Salt Lake Tabernacle. He greeted me at the lobby, where all 34 different beers in 22-ounce bottles were available in giant refrigerators. The brewery separates its line into three categories: classic, elevated and exponential, in the order of alcohol volume and experimentation. Koonce said that one of Epic’s goals is to introduce to a lot of Utahns to bolder beer. This includes their surprisingly strong Pfefferhorn Lager in their classic series, award-winning and aptly named Hopulent IPA and Sour Apple Saison and Belgian-style golden ale that uses French oak white win casks and peach puree to create its Brainless on Peaches. “We’re trying to provide something here for local beer drinkers and the tourists too,” Steve said. He walked me through the brewery’s “Tapless Tap Room,” where customers can try their beer poured from bottles and have a bite to eat; one of Utah’s other unique laws is that drinkers must order food if they’re going to drink beer on the premises. Epic does not make “3.2” beers, so it can’t pour its beer from the tap. It does, however, provide kegs for its out-of-state clients. Epic distributes to 12 states; Washington, DC; and Japan. The closest you’ll find it to Connecticut is New Jersey. Steve introduced me to Steve introduced me to head brewer Kevin Crompton, a lanky, tall, and bushy-bearded zymurgist. “We celebrate diversity within the brand,” Kevin said. He’s worked for three other breweries, so he knows. Unlike many of the beer drinkers I met, the veteran of crafting “3.2” beers had nothing bad to say about the low-alcohol style. It shocked me when Steve and Kevin explained how each beer has its individual water, grain mix, hop selection and yeast to build the style the brewery wants. It not only takes a heap of planning, but it’s an expensive venture. Epic also employs 20 brewers, with three of them dedicated “cellar men” who work on yeast propagation and making beer in casks. I tried a sample of Epic’s Glutenator, which is created so that it’s free of the protein gluten, to which some are allergic. It’s made with substitutes for barley, which contains gluten: millet, brown rice, sweet potatoes and molasses. “It’s built like a beer, not a gluten-free beer,” Kevin said. It didn’t have a lot of body, but it still had a nice, light crispness to it. No hint of sweet potato. We drove over to The Beerhive, which Steve said was one of the best bars in the city. On the way, we talked about the sizable influence of the LDS on beer legislation. The Beerhive is a dark, wood-filled pub with glints of stained glass and lots of local beer advertising. We took a booth and ordered up some light fare. I had my first “3.2”: a Salt Lake-based Red Rock Brewing amber. I found it to be pleasantly malty, and even though it was a bit thin, I liked it a lot with my chicken strip salad. I had heard bad things about “3.2”s, and found that surprisingly, I craved more. From Desert Edge Brewing, also of Salt Lake, I tried the Latter Day Stout. It was a bit chalky and dry, and lacking in taste. It was also the wrong beer to order after a day of heat in the 90s. Perhaps it was still a joy to drink because of the elevation, which in Salt Lake is over 4,000 feet, compared to Waterbury, which is about 4,000 feet below that. Del Vance, who wrote “Beer in the Beehive,” owns the pub. He stopped by briefly and talked about his clientele. My sister, cousin, and I drove about 30 miles east to the resort town of Park City, known for its winter Sundance Film Festival. Park City’s main street, which during the festival is crowded with celebrities, is a place for the well-to-do to live and vacation, but even a shlub like me can spend a few hours there. There were plenty of shops and coffee shops and restaurants, including Zoom, Robert Redford’s restaurant. Ski lifts carried tourists who wanted to get a look at the green mountain. Beauty is everywhere you look, and you almost get used to the mountains in the distance. Wasatch Brewery – established in the microbrewery olden days of 1986 –is right in the midst of it all, and contains a pub and adorable flower-accented patio called the Cantina. While at Wasatch, I met Matt Beamer, the head brewer at Wasatch, who sidled up to the table I shared with my sister and cousin, and drank beers with us during a very free-flowing interview. Matt is 43 and hails from Michigan. 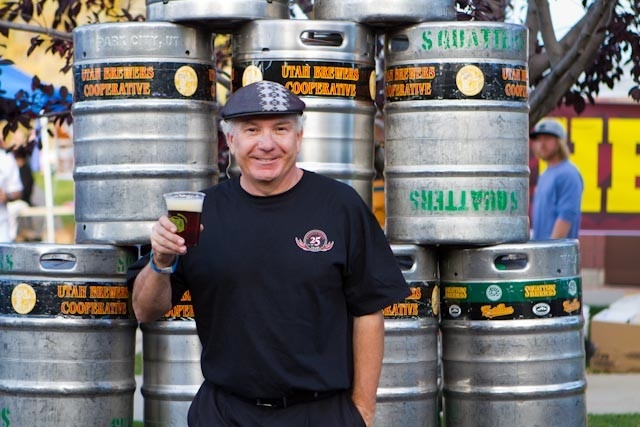 He moved to Utah 20 years ago, and after stints with other breweries, he found himself at Wasatch 10 years ago. The brewery has a bit of a rebellious attitude that tweaks the Mormon faith, and Matt personifies it. The brewery, for example, has a Polygamy Porter (“Bring some home for the wives!” it says on a t-shirt). There’s also the Outer Darkness, a highly alcoholic Russian Imperial Stout that Wasatch brews with Squatters Pub Brewery. Outer darkness is what Mormons refer to as a kind of hell. Brewing “3.2” beers – as many of Wasatch’s selections still are – “makes me a better brewer,” Matt said, since over- or under-hopping with so little malt to create the alcohol can be very obvious. Beamer has done it, especially with his jalapeño cream ale. It was extremely powerful. I enjoyed it, even though I couldn’t finish it. Matt suddenly looked exhausted just describing how he and his assistant brewers cut up 160 pounds of jalapeños to make it. The 2002 Winter Olympics in Salt Lake City elevated Wasatch’s profile, especially when the small brewery took on Anheuser-Busch as the Olympics’ “official” beer. The brewery put out its Unofficial Amber in retaliation. Matt couldn’t end the interview without needling the Mormon’s one more time, and told me a joke I’d heard twice since I landed in town. I don’t mean to pour it on with the Mormon disrespect. Personally, I cannot say enough about how nice the LDS community was when I was in Utah. The staff at Family History Library were extremely patient and kind, and other Mormons that I met were gracious to visitors like me. Sometimes it takes resistance to inspire creativity. If that’s the case, I hope the brewers in Utah keep on resisting… and start distributing in Connecticut. Contact Beer Snob by writing him an E-mail: beer.snob@yahoo.com, liking him on Facebook or following him on Twitter: @BeerSnobCT. 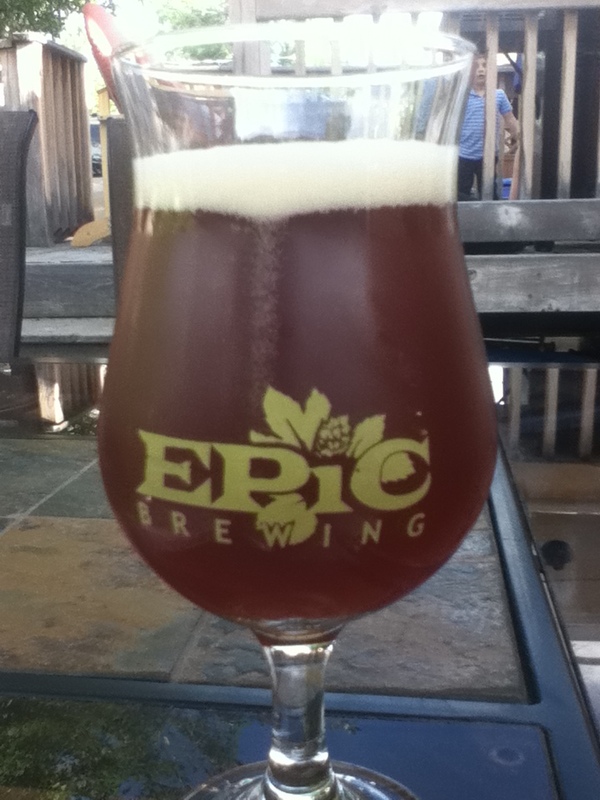 This entry was posted in Beer Snob and tagged Beerhive, Epic Brewing, Utah, Wasatch Brewing. Bookmark the permalink.